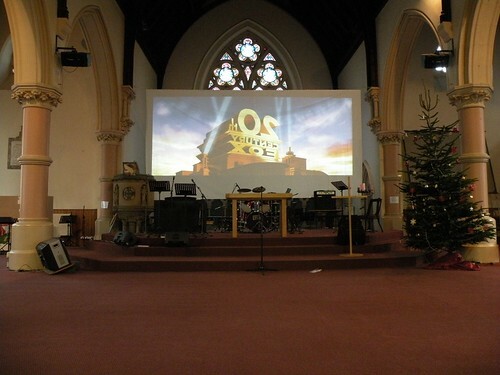 Basically what we wanted was to fill that space at the front of church with bigger images. 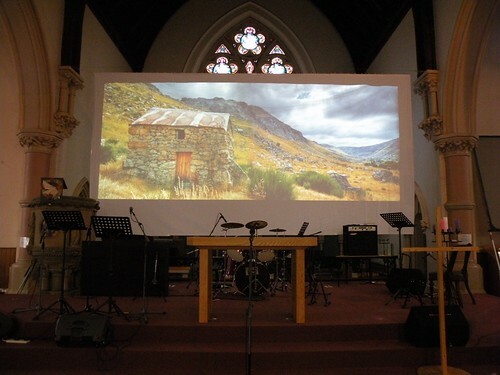 To have more screen real-estate to mess around with and because it is generally worship we are producing visuals for we always need to put song words somewhere and it is difficult to be more creative with this than simply overlaying. So ArKaos GrandVJ software can address larger images and Maxtor Dual Head 2 Go can take this widescreen image and send it to two projectors which when merged create one large image. The problem that remained then was what to project onto, which is what this post is about. The solution was to go low-tech and inexpensive, but until we rigged it up in this experiment we weren’t sure how it would work. So first of all here is how it looked then I’ll explain how this screen is made. 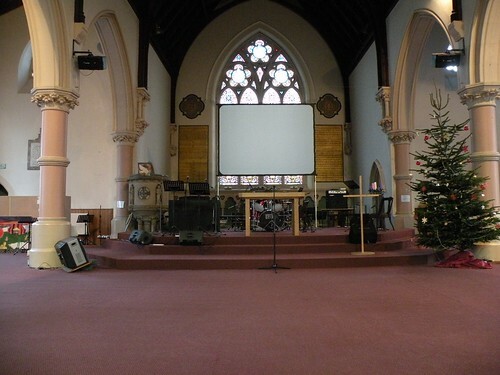 This is how the space looked before we started, with a 10′ x 8′ fast fold screen (and a christmas tree that looks as if it is going to fall over, but it did actually last at this angle for another two weeks). And here is the screen in place. First thing to notice here is there is a little bit of a droop with as much tension as we could put onto this. 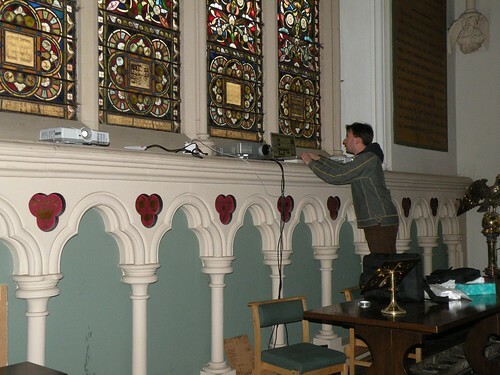 We decided that this way of rigging wouldn’t be used, even though it was quick and could all be done from floor level, when we use this for an event we will hang it from a wire which is in place so that those ‘ripples’ in the screen can be removed. 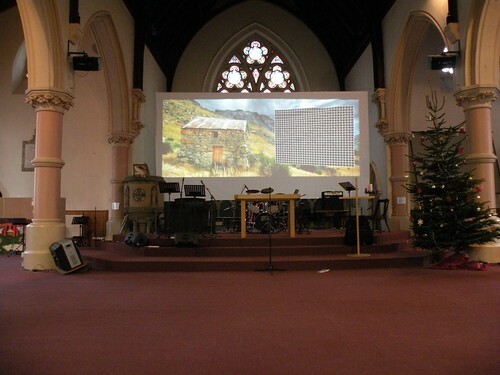 And here is a sample widescreen desktop image – can you see the join between two projector images? Can you see the seems between 8 different shower curtains? 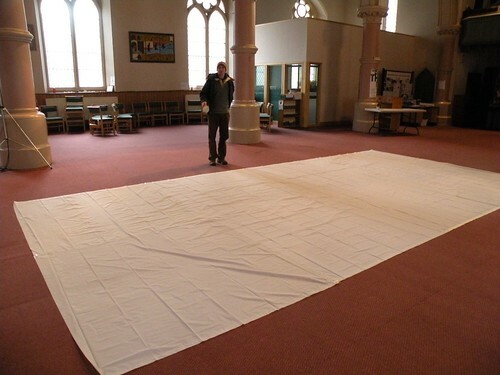 This image is taken from the same position as the first image to show just how much larger an image will be. Also the grid area is a possible position for say song words on a fully motion background to show how different areas of the screen may be used. So, what is that screen made of? It is eight white ‘Saxan‘ shower curtains from Ikea carefully taped together edge to edge using clear packaging tape. Yep, 8 shower curtains that cost under £3 each and some tape that costs £1 so total cost of this screen under £25. How to make it: while it is simply a case of laying out the curtains edge to edge and taping so that there is no gap or overlap. However, don’t underestimate how precisely this has to be done, and how time consuming this may be. Rigging, as mentioned above, we are changing the rigging so I’m not going into details here but basically what is required is to keep the edges under enough tension in order to keep all the wrinkles out. But, the main thing we learned from this test was that this screen is of excellent quality for back projection. The image was crisp and clear, there was no sign of the seams visible and it was fairly easy to set everything up. The only downside we can think of at the moment is how robust this screen will be. How will those seams hold up? Will there be wear and tear on the rigging points, tape, etc? How long will it last? 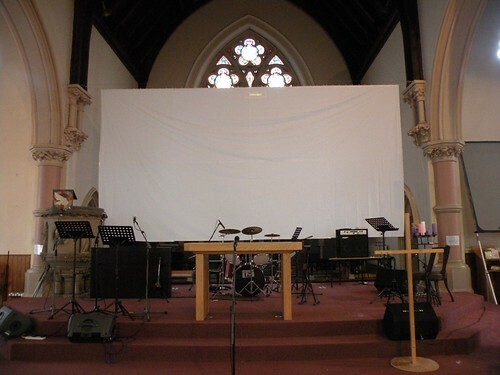 Also, although the test images above were taken in daylight the church does get much brighter in summer months even during evening services when that large window behind the screen gives us lots of problems – will this screen hold up in those conditions. Overall, certainly at £25 + time it is worth trying. Not a solution for gigging or moving around to different venues but certainly worth trying out in this situation and I’ll add to this any notes over how it works. The first outing will be at a Ceilidh in a couple of weeks. 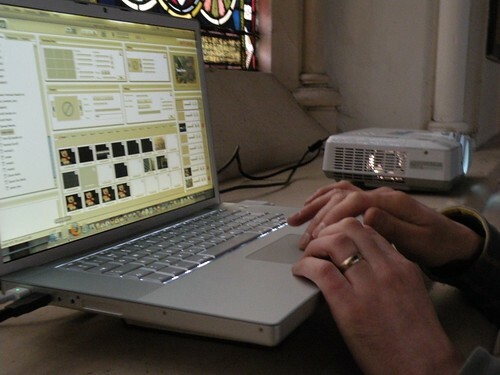 This entry was posted in Christian Worship, how-to, performance visualist. Bookmark the permalink.